School Screening activities were initiated in the capital city of Delhi, India. A Proforma for school screening was prepared. This proforma was based on the World Bank TQSI (Ten Question Screening Index) for disabilities and was translated into Hindi. An examination proforma was also prepared. Schools for screening of the Primary school going children were identified by the Rotary Club of Delhi (South). Contact was established with the concerned officials and permission obtained for carrying out the required survey. On the day prior to the screening, a visit was made to the school and a meeting was held with the teachers of the primary sections. They were instructed regarding the objective and methodology of the survey to be carried out. They were informed about the common ear diseases that are prevalent among children and the need to identify these. They were then introduced to the Screening proforma. They were informed about how they had to fill it for each of the children in their respective sections. Promotional talk: A brief talk was held in the morning, prior to the actual screening. This talk included: importance of Healthy Ear Care habits and principles of good ear & hearing hygiene. 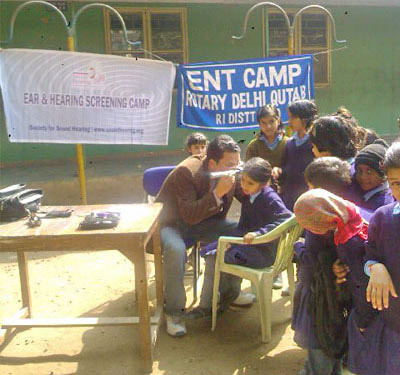 During each such camp, posters and charts were put up at the schools in order to promote Good Ear & Hearing care habits. Impedance Audiometry: with a hand held screener, in order to identify Secretory Otitis media. Require special attention: to be sent to tertiary referral hospital for investigations and treatment. 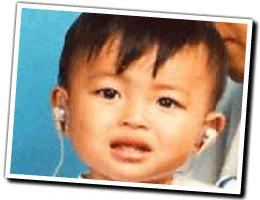 Children with Safe type of Otitis Media, Mild- moderate hearing loss fell in this category. Require URGENT attention: to be sent to Tertiary hospital, at the earliest possible for suitable treatment. Children suffering with Unsafe type of CSOM, Severe hearing loss of any nature were included in this category. Attempts were made to talk to the parents of such children. This was made possible by the fact that a large number of the families lived in the close neighbourhood and the parent often came to school to pick the child up at closing time. Contact was made with the parent at that time in most cases needing urgent attention and they were informed about the problem and the need to address it as well as the suitable timing for them to come to the hospital. A referral slip was also handed over to them, to facilitate their visit to the referral hospital. Wherever, the parents could not be contacted as well as in the other referred cases, the teachers were given the referral slips, to be handed over to the parents with suitable instructions. Following the conduct of the camps, all the proformas were collected. Those positive on the proforma were recorded. Those with findings pertaining to ear and hearing related diseases on clinical examination were recorded and the point prevalence of the various ear diseases computed, as given in Table 1.